Now packed with wide selection of 148 Premium HD Motion Backgrounds that cover huge varieties of themes that you can use to enhance any of your rich media project easily! A Big Collection of 148 HD Motion Backgrounds that cover varieties of different themes that you can use them in any of your rich media project! Affordable price and friendly licensing. For one low price you will get instant access to 148 Motion Backgrounds with Royalty free license that allows you to use the files for personal or commercial nature projects! Each of the videos you will receive with Motion Suite Pro V.3 is in high resolution format to give you all the rich details possible that will captivate your viewer. 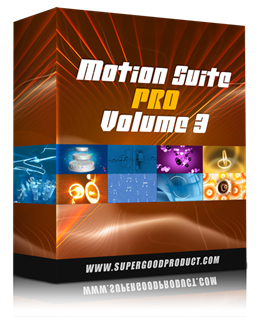 The awesome thing about Motion Suite Pro V.3 is that the videos in the collection are compatible with most of your favorite video editing software, below are just a few of the video editing software that are compatible with Motion Suite Pro series. AE-Camtasia Studio and many more! Watch the videos at http://onlinevideoworkshop.com/motionsuite to see what the Motion Backgrounds look like in the Motion Suite Pro V.3. Watch Ryan Phillips Make Video Sales Magic!